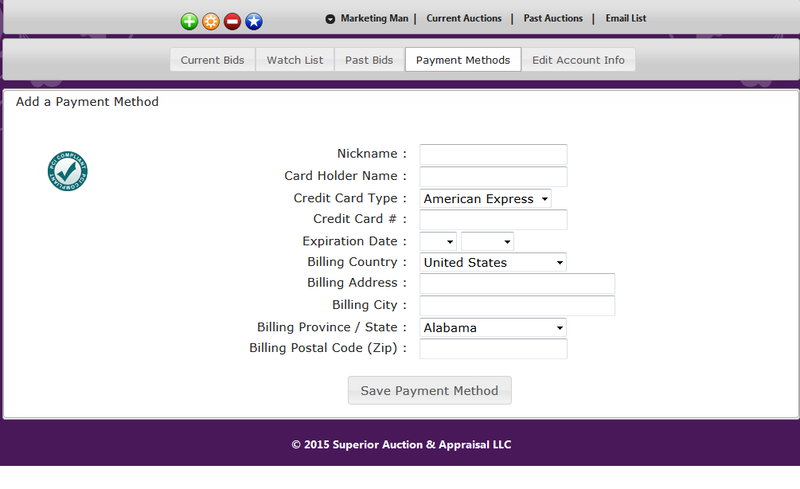 Payment & Account Options - SUPERIOR AUCTION & APPRAISAL LLC. How To Add, Remove, Or Change Personal & Payment Information. Next To Your Name On The Toolbar You Will Find A Down Arrow. When You Click On It You Will Get A Drop Down Menu, Shown Below. 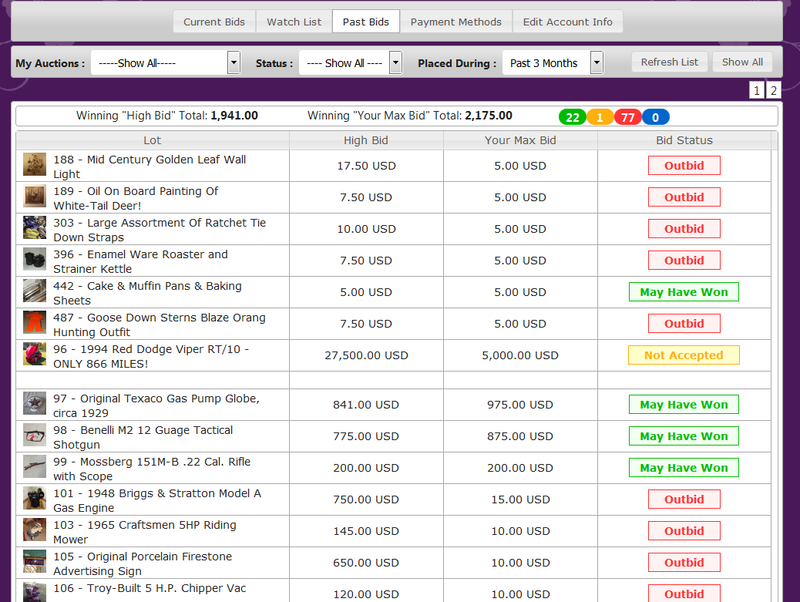 The Current Bids, Past Bids & Watch List Pages Are Very Similar. 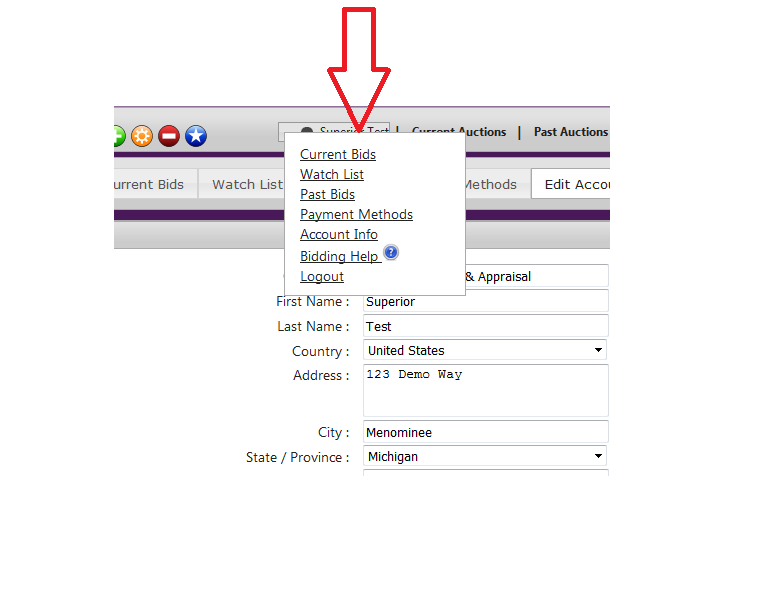 These Pages Will Show The Items You Have Bid On Or The Items That You Have Added To Your Watch List. The Bidding Pages Will Show The Lot, Your High Bid, And The Current Winning Bid. 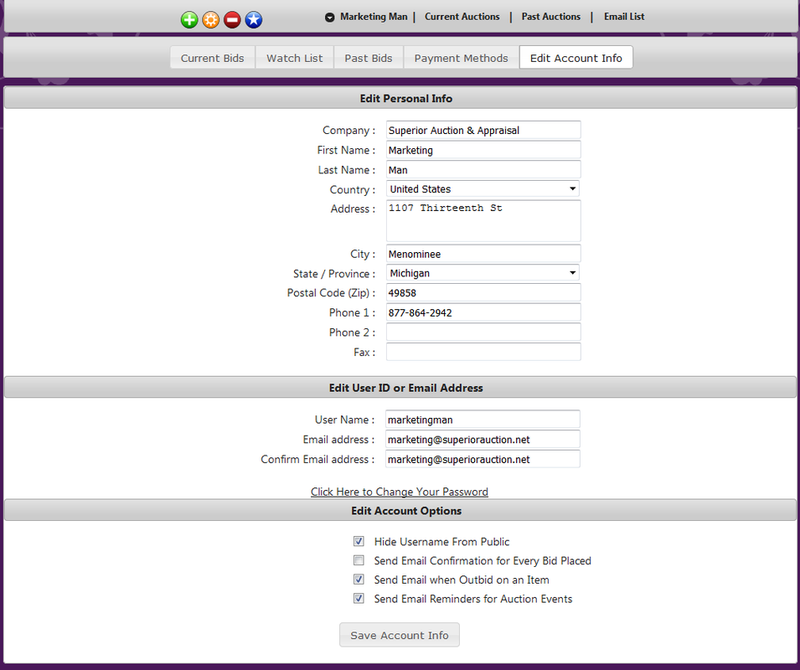 It Will Also Show Your Bid Status On Items You Have Bid On. Bid Status Will Say "Winning" On Lots That You Are The Top Bidder On While The Auction Is Running. If It Says "Outbid", You Are No Longer The Top Bidder. After The Auction Is Over The Status Will Be "May Have Won" On All Items That You Are The Top Bidder For. This Status Is Shown Because Even Though You Are The Top Bidder, The Item May Have A Reserve And Will Not Be Sold. Your Invoice Will Be A True Reflection Of Which Lots You Have Won. We Also Have The Ability To Set Bidding Limits, In Which Case The Auctioneer Must Approve The Bid. If This Is The Case Then Your Bid Status Will Say Either "Pending Approval" Or "Not Accepted". The Fourth Option On The Drop Down Menu Is "Payment Method". When Clicked You Will get The Page Below. This Is Where You Can Add, Edit Or Remove Credit Card Information. The Fifth Option On The Drop Down Menu Is "Account Info". When Clicked You Will get The Screen Below. This Is Where You May Edit Your Personal Information, User ID, Email Address & Other Account Options. 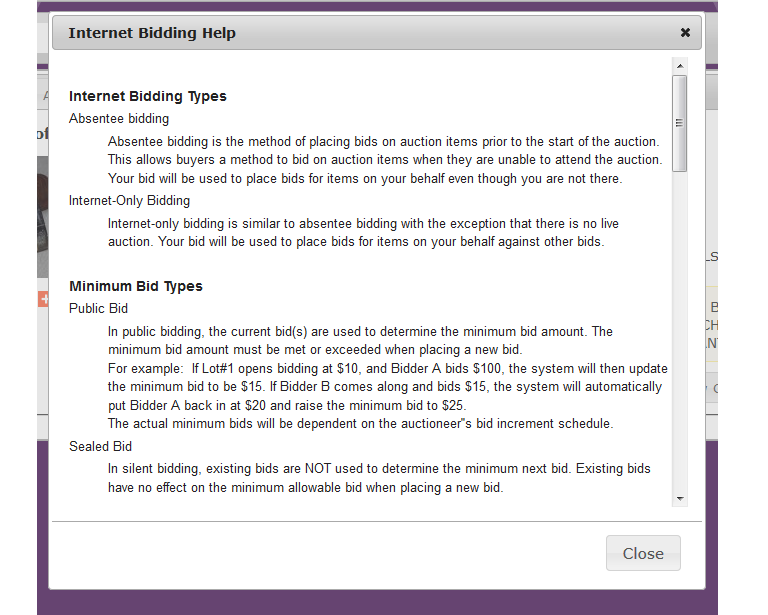 The Sixth Option On The Drop Down Menu Is "Bidding Help". When Clicked You Will get The Screen Below. This Is Where You Will Find All The Information You Will Need To Know About Bidding On The Bidopia Platform. The Last Option Is "Logout". You Can Click On This Option To Log Out Of Your Account!